"Looking for birds; looking for love. Which is easier to find, a good guy or a dove?" I love the cooler weather and I love seeing all the birds coming in! I have dark eyed juncos, black capped chickadees, chestnut backed chickadees, downy woodpeckers (in photo), northern flickers, house finches, gold finches, anna's hummingbirds, bushtits, and a song sparrow coming in. I also have the "snarlings" AKA starlings coming in but I try to ignore them. I am anxiously awaiting the pine siskins and varied thrushes as the weather gets colder. The trees may be barren but the birding is plentiful! OK, this might seem odd to most people but in my 50+ years of sleeping, I HAVE NEVER SLEPT IN THE BUFF. It never "felt right". But lately, I have noticed a LOT of tossing and turning and feeling like my nighty was bunched up/twisted and for someone with fibromyalgia, ANYTHING that affects our sleep is BAD, BAD, BAD!! So last night, as a lark, I went to bed without wearing anything and it felt WONDERFUL!! Not only that, but when I woke up my hair wasn't sticking up all over the place, a clear indication that I was NOT tossing and turning!! I find this very interesting; not just that it felt good, but that I could try something out of my comfort zone and discover a new way of doing things! Just as I lamenting the lack of bird action, (yet another reason besides the heat that has me somewhat disliking summer) a slew of birds showed up yesterday! I had my usual chickadees, house finches, scrub jays and hummers, but I also had a flock of bushtits come through to feast at the suet! I hadn’t seen them for awhile. Then I had THREE flickers come in: Mom, Dad, and a male youngster, who still had to be fed by dad after he ate some suet! Very cool to watch! The biggest surprise was having three juncos show up, totally out of season! Normally these are my winter birds by the dozens, and they typically head for higher and cooler elevations around May. A couple must have stayed behind and nested, because there was one adult and two juveniles who had to be fed. It was very cute to watch but of course my Birdcam was not set up to catch the action. Today I went and bought a big compressed block of various seeds/food for wild birds. I have it set out under my feeders and the Birdcam is set up and ready. I hope some birds discover before the squirrels do! Well, a week after I was laid off I received a letter stating that I now have an assignment for the Fall! It's reduced hours but I still get partial benefits and pretty good ones at that! There could still be a lot of changes before September but I am happy and relieved to at least have something to start off with!! I had read about using a slinky toy on a bird feeder pole to deter quite some time ago but really didn't think it would work. After all, nothing else can keep the squirrels away from the feeders! I even tried greasing the pole with petroleum jelly but that was a mess, and didn't last long in the heat. However, my space for feeders is limited and the squirrels were taking over so I decided to give it a shot. IT WORKS!! The second they touch it they back off! 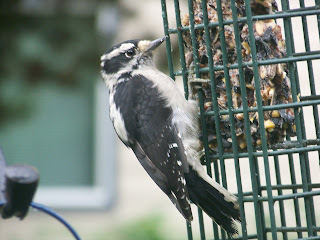 I haven't seen a squirrel on the feeders for a week now so seed is lasting longer for the birds (and saving me money). I do throw out some peanuts and sunflower seeds on the ground (and in the lowest feeding tray) for the squirrels because I do enjoy watching them; I just wanted to the birds to be able to get to their feeders! Such a simple fix! It doesn't look too bad either; at least it's something I can live with. Last Saturday was my second time doing the bird survey for our city. It was a drizzly, overcast day. I really didn't want to get up so early and go out into the cold. But once I got going, it was so much fun, even trekking through wet brush and walking on muddy paths. With my new binoculars, I was able to spot a few birds before my partner did so I felt I was really contributing this time! Still, she totally outpowers me on the bird calls! She gave me a CD with bird calls and songs on it, and I find it amazing that a single bird can make so many sounds!!! And when a lot of birds are calling at once, I find it impossible to isolate them! So I have a lot to learn still but it's always fun and I'm grateful that even though I might be laid off, watching birds is free! Today one of my bird photos was published on the NPR website to highlight today's "Birdnote" radio spot. It is such a thrill to have my photo (and one of my favorites!) published, but even more, it's a good feeling to know that it's posted with information to help our bird friends. Check it out here! Be sure to click on "enlarge" to see my whole photo. I've only been in Oregon for 5 years and I love it here! What an adventure it has been, moving to a new state and starting over! Don't even get me started about dating! LOL I have a passion for dancing, a love of birding and a strong faith in God. "If you have the choice to be kind or be right, choose to be kind."